In 2001 a friend shared a link to this paper, ‘Folk Computing: Revisiting Oral Tradition as a Scaffold for Co-Present Communities’. There’s one part of it that really struck me then and I’ve thought about many times since (and it’s more interesting than the academic title sounds). The name “i-ball” is short for “ball of information.” I-balls are simple software folk objects that have some toy- and game-like qualities. People can design their own i-balls and then share with other members of community. In our prototype, i-balls exist on key-chain-sized video game devices made by SEGA and sold as part of their DreamCast video game system, as shown in Figure 1. 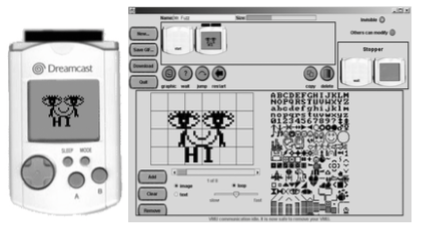 We wrote our own software for this commercial device, and renamed it the “i-socket,” to distinguish its capabilities from those of the original SEGA “Visual Memory Unit (VMU)”– designed to let kids store and recall their state in a particular DreamCast game. People design their i-balls on a PC using a prototype graphical programming tool we developed. The most basic form of i-ball consists of a single “animation” programming block. This block allows kids to “decorate” their i-ball by composing an animation out of 128 different letters and icons in a simple “flip-book” style animation editor. Figure 2 [above] shows the first frame of an animation a child created that depicts a face that blinks and says “hi”. I-balls created on a PC can then be downloaded to an i-socket via a small “docking station”. Like the play objects they are named after, i-balls can be passed between people. Participants can give a copy of one of their i-balls to someone else, or, using “jump” blocks and “rule” blocks in authoring environment, i-balls can be programmed to “bounce” from one person’s i-socket to another’s, based on user-defined rules. One of the most interesting “ahas” came after a third grade class viewed a visualization of how one of their favorite i-balls had spread. Someone in the class had made an i-ball version of the class mascot: a bunny named Shadow. They felt this i-ball was very popular and asked several times for a poster-sized printout of how it traveled through the school. When we brought it to their class, however, they were disappointed. The visualization revealed that while most of the third-grade had gotten a copy of the Shadow i-ball, it had not spread much beyond that. After a long discussion, it became increasingly clear that the third grade had come to believe that because everyone in the class had seen Shadow, many in the school probably had as well. This led to some interesting conversation about the limits of generalizing what is true about your close-knit group to what is true about the larger population. Ordinarily, of course, the mistaken beliefs of the third graders are self-sealing. People’s folklore universe is determined by whom they interact with, and there is no way of getting outside this universe to test the limits of it. Phenomena like insularity are notoriously hard to see from the inside. When I first read this I’d already read a fair bit about social networks and the diffusion of ideas through them, but this bit was my own “aha” moment — I don’t think I’d seen such a clear example of a group of people assuming their entire “universe” thought like they did. When everyone in your social group is aware of many of the same things it’s really hard to see the broader world objectively. You assume what’s common knowledge for your peers is common knowledge for everyone. I’ve thought of that class so many times over the years because we see similar behaviour over and over again: People being surprised at how the wider world doesn’t know what they know, and often laughing at someone in the wider world for their apparent lack of “common” knowledge. 5:28pm: @gwire I am shocked, SHOCKED, to see the Doctor dealing with Daleks accompanied by a young woman. Is there no end to this innovation? 1:23pm: @ludflu Well he’s not a bot, as in algorithmicly generated, so he’d probably be fine. 11:30am: @morrick I shall travel back in time and silence them, one algorithm at a time, to save humanity’s future sanity. 11:28am: I mute (nearly) all twitter bots. I am The Bot Muter. This gets more amazing the further you read. Things just get messier and messier. The 'New York' article linked to near the end is also good, and similar.